A wedding which attracted considerable interest, and drew together a crowded congregation of friends and well-wishers, was solemnised at the Rushden Parish Church on Tuesday afternoon. The happy pair whose fortunes were the centre of interest, and who received the hearty congratulations of a very large circle of friends, as well as the good wishes of the inhabitants of Rushden generally, were both connected with well-known families in the town. The bride was Miss May Skinner, eldest daughter of Mr. G. H. Skinner, of Rushden, and the bridegroom was Mr. George Denton, eldest son of Mr. George Denton, C.C., of “Eastfields,” chairman of the Rushden Urban Council, and head of the firm of Messrs. B. Denton and Son. The bride was most becomingly attired in a handsome dress of white satin, with long court train. The bodice was elaborately tucked and trimmed with real lace, the skirt also being tucked and trimmed with rucked chiffon, and embroidered with lace and lovers’ knots. She also wore a bridal veil, with orange blossoms, and carried a splendid shower bouquet of white lilac, lilies of the valley, Lilium Harrisi, Eucharis lilies, white roses, and stephanotis, with trailers of asparagus fern. The bridesmaids were Miss Annie Skinner and Miss Alice Skinner (sisters of the bride), Miss Mabel Denton and Miss Frances Denton (sisters of the bridegroom), together with Misses Kathie and “Baby” Denton (sisters of the bridegroom). The first four wore dresses of white muslin, elaborately trimmed with tucks, lace and insertion, with a large chou and long ends of daffodil yellow crepe de chine. Their hats were of white crinoline straw, trimmed with tucked chiffon, long ostrich feathers, and yellow roses, and they also wore gold brooches set with ruby and pearls, the gifts of the bridegroom. The two young bridesmaids had similar dresses, with Dutch bonnets, and wore heart-shaped lockets with turquoise setting, also the gifts of the bridegroom, each carrying a shepherd’s crook of yellow roses. The elder bridesmaids carried bouquets of yellow roses, the gifts of the bridegroom. The bride was also attended by two pages suitably attired in white satin suits, these being Master Billie Skinner (cousin of the bride) and Master Don Denton (brother of the bridegroom). Each wore a gold pin, presented by the bridegroom. Mr. Reg Denton (brother of the bridegroom) efficiently discharged the duties of best man. The church had been tastefully decorated with white flowers, ferns, and palms. The whole of the flowers were supplied by Mr. Seckington, florist. Later in the day the newly-wedded pair left for Torquay, where the honeymoon is being spent. Mrs. Denton’s travelling dress consisted of grey tweed coat and skirt, and she wore a smart hat of Tuscan straw, trimmed with feathers and tucked pink silk. 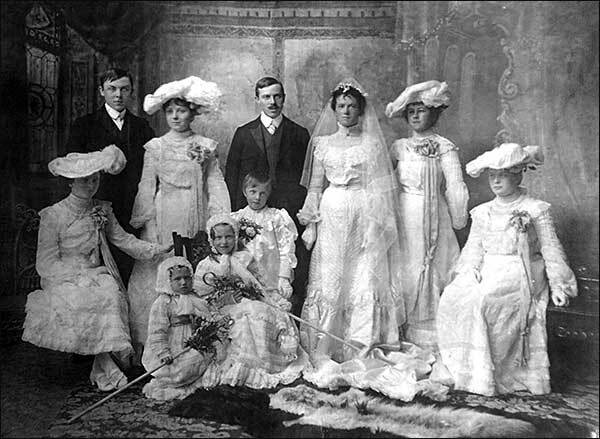 After the ceremony a large number of guests were entertained by the parents of the bride at the Waverley Hotel, those present including the following :- Mr. and Mrs. G. Denton and family, Mr. and Mrs. John Mason, Mr. and Mrs. H. T. Wilkins (London), Mr. and Mrs. W. H. Skinner, Dr. and Mrs. Baker, Mr. and Mrs. C. Claridge, Mr. and Mrs. H. Brawn, the Rev. J. G. Forrest, Mr. and Mrs. Fred Cave, Mrs. T. Denton, Dr. and Mrs. Owen, the Rev. and Mrs. Morse, Mr. G. Skinner, Miss Prole (Elstow), Mr. and Mrs. W. B. Skinner (Arkley), Miss Darnell (London), Mrs. Carter, Mr. and Mrs. McLeod, Mr. and Mrs. Arthur Cave, Mr. and Mrs. G. S. Mason, Mrs. J. Lovell (Podington), Mr. G. H. Claridge, Mr. and Mrs. Amos Cave, Mr. and Mrs. Banks (Pertenhall), Mr. C. R. Claridge, Mr. and Mrs. Heygate, Miss Parker (Higham), Mr. Ward, Mr. and Mrs. E. Claridge, Mr. F. E. Preston, Mr. and Mrs. W. Colson, Miss Colson, Mr. and Mrs. G. Miller, Mr. O. Claridge, Mrs. M. Skinner (Northampton), Mr. J. C. Lilley (Ealing), Mrs. Dean (Bedford), Mrs. Merriman (London), Mrs. Jaques (London), Mr. E. Lilley (Ealing), Mrs. Brawn, sen., Mr. C. Brawn, Mr. and Mrs. J. Clardige, Miss Singleton (Lincoln), Miss M. Brawn, Mr. R. F. Knight, Miss Knight, the Misses Smith, Miss R. Parsons (Irchester), Mrs John Brawn, Miss Achurch, Mr. and Mrs. Ette, Mr. and Mrs. W. Denton, and Mrs. F. Newman. The handsome collection of presents included the following :- Father of the bride, cheque; mother of the bride, cheque; father of the bridegroom, cheque; mother of the bridegroom, piano; Mr. R. Denton, table silver; Bert, Ted, Annie and Alice Skinner, silver revolving breakfast dish; brothers and sisters of the bridegroom, table cutlery; Mr. and Mrs. T. Lilley, silver tea service; Mr. G. Skinner, table silver; the Rev. and Mrs. W. R. Morse, silver hot water jug; Mrs. T. Denton, Chippendale table; Mr. and Mrs. G. Miller, crumb scoop and tart server; Mr. and Mrs. W. B. Skinner and family, case of silver brushes, mirror, etc. ; Miss Hammond, water colour painting; Miss D. Hammond, table centre; Mr. and Mrs. P. Brown, crown Derby afternoon tea service; Mr. and Mrs. C. G. Jowitt, revolving book case; Miss Achurch, oak tray; Mr. and Mrs. C. Claridge, dinner service; Miss Prole, real lace sachet; Mrs. Prole, afternoon tea cloth; Miss F. Evans, ornaments; Mr. J. E. Mantle, hand painted table centre; Miss K. Lilley, silver flower vase; Mr. and Mrs. W. H. Skinner, dessert service; Mr. C. and Miss M. Brawn, Worcester ornaments; Mr. and Mrs. J. Lovell, case of carvers; Mrs. Carter, silver sugar basin; Mrs. Hardiman, table centre; Mrs. Prestige, pillow lace d’oyleys; Mrs. M. Skinner, silver antique butter knife; Mr. F. E. Preston, case of carvers; Mr. and Mrs. Hartop-Burns, silver mounted scent bottle; Mr. and Mrs. Evans, muffineer; Mr. and Mrs. Heygate, silver photograph frame; Mr. Jacobs, pictures; Mr. R. F. Knight, smoker’s cabinet; Mr. B. Ette and Miss Shorley, clock; Mr. Walter and Miss Ada Ette, dinner mats; Mr. and Mrs. G. F. Raven, book of views; Mr. and Mrs. T. Lilley, jun., silver salts, peppers, and mustard; Miss Singleton, d’oyleys, tray cloths, and lace; Mr. and Mrs. H. Wilkins, silver-mounted bread board and knife; Miss Parker, silver-mounted bottle; Mr. and Mrs. McLeod, pair of silver candlesticks; Mr. and Mrs. Skinner, copper kettle; Mr. and Mrs. W. Denton, set of hot water jugs and tea board; Mrs. John Brawn, silver serviette rings; Mrs. Brawn, sen., silver bread fork; Mr. H. T. Wilkins, clock; Mr. Reeve, silver apostle tea spoons; Miss G. Claridge, silver-mounted scent bottle; Miss R. Parsons, muffineers; Mr. and Mrs. G. S. Mason, hand painted stools; Mr. C. Smith, scent spray; Mr. and Mrs. Webb, silver-mounted specimen glasses; Mr. and Mrs. Horace Brawn, table silver; Mr. and Mrs. J. S. Mason, salad bowl; Mr. Harold Lilley, silver toast rack and butter knife; Mr. J. C. Lilley, silver sauce tureen; the Misses Smith, picture; manager and employees of the “Lightstrung” Cycle Company, leather writing desk; employees of the Rushden Machine Joinery Works, brass hot water kettle; Mr. and Mrs. Arthur Cave, silver bon-bon dishes; Mr. and Mrs. Fred Cave, silver fruit spoons; Mr. and Mrs. E. Claridge and family, pictures; Mr. J. E. Smith, pearl and silver paper knife; Mr. and Mrs. Colson, brush and crumb tray; Miss Colson, carved breakfast board; Miss Gladys Colson, silver-mounted specimen glasses; Mercy, curtain holders; Mr. and Mrs. Amos Cave, silver tea spoons; Mr. and Mrs. Ette, copper kettle and silver cruet; Mrs. Dean, real lace handkerchief; employees of B. Denton and Son, boot factory, Rushden, combined oak music cabinet and book case; Dr. and Mrs. Baker, silver flower vase; Mr. and Mrs. F. Newman, silver cucumber dish and knife; Miss Pixie Skinner, pin box; teachers and choir of the Independent Wesleyan Church, clock; Mr. Kemshead, cut glass and silver salts; Mr. and Mrs. Bramley, inkstand; the gardener at Eastfields, oak tray; Mr. and Mrs. J. S. Clipson, Chippendale flower stand; Mr. and Mrs. John Claridge, fish knives and forks; Mr. C. G. Ward, biscuit barrel; Mr. and Mrs. A. Sykes, silver cake basket; Mr. and Mrs. W. Bird, cut glass water jug; Mr. and Mrs. Merriman, silver pickle and sardine forks; Mr. and Mrs. J. Jaques, silver tea spoons; Mr. and Mrs. Rose, honey jar; Mr. and Mrs. J. D. Cunnington, silver-mounted bread board and knife; Mr. and Mrs. C. G. Cunnington, silver table spoons; Ernest, Connie, Robert, Charlie, and Hugh Cunnington, salad bowl; Dr. and Mrs. Owen, cut glass sugar and silver spoon; employees of Mr. G. H. Skinner, silver teapot; Mr. J. G. Wiggins, toilet soap; Mr. and Mrs. J. W. Ashdowne, silver photograph frame and cigarette holder; Mr. Frank White, silver butter dish and knife; Mr. H. B. Flook, travelling clock; Mr. and Mrs. C. Banks, pearl and silver jam spoons; the Misses Darnell (London), fruit knives, etc.